A few years back I took lessons from the jazz guitar chair at DePaul University here in Chicago. My transcript said his name was Robert, and he went by Bob, but among his guitar students we had a different name for him: Yoda Bob. He was THE teacher, a preternatural intelligence. Raised in a boys school for precocious musical talent, he spent two hours a day, five days a week drilling music theory and ear training for years, so he knew the academic side of music inside and out. But he also lived in the real-world practical side as well: he had toured and recorded with dozens of well-known artists. He could play a clean-toned straight-ahead jazz gig on Monday, a tripped-out psychedelic effects-laden noise freak-out on Tuesday, then back a singer-songwriter on Wednesday, effortlessly singing harmonies to tunes he was sight-reading for the first time. In lessons, he would tell allegorical stories, make keen observations after listening to you play for mere seconds, offer mind-expanding suggestions, and encourage you with his genuine enthusiasm. He also had a number of Yoda Bob-isms, dense little sentences that he’d repeatedly drop on you, delightedly watching your gears turn as you tried to parse the language. Play behind the beat and ahead of the changes. 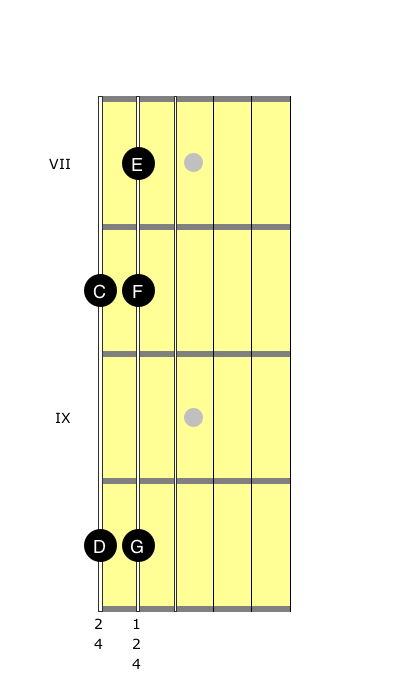 The consonant extensions to any common tertiary seventh chord lie a whole step above the tones of the basic triad. You should never try to beat your fastest tempo without also trying to beat your slowest tempo. It’s the kind of thing they ought to print on the outside of the metronome box (or have on a pop up inside the metronome app). It never even occurs to most of us that we ought to be trying to play guitar slower. Trinity leaps up to swan kick her assailant, and then the action slows down as she hangs there mid-air. The camera swivels around them to a new angle, and then the action resumes at its normal pace. It’s a stunning use of groundbreaking technology not just for its own sake, but for the sake of telling a better story. I remember sitting in the theatre, watching it for the first time, jaw hanging open. I turned to my friend, who was similarly agape, as we said in unison: whaaaat? We’re going to take something that previously went by too quickly to be seen and make it clearly visible. Once it’s visible, you can swivel the camera of your attention around it to focus in on it from new angles. Before we try to get all Bullet Time, let’s get you playing something slightly more interesting than the Bury The Click exercise. 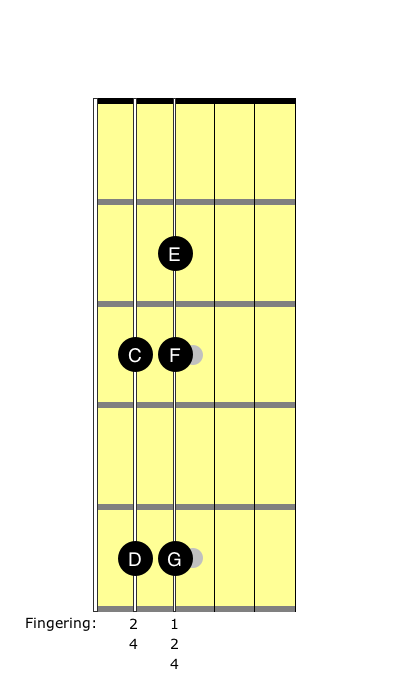 Here’s the first five notes of a C major scale, played up and back. It’s the same notes (and the same shape) either way. Take a minute to memorize it––you won’t be able to focus on it properly if you still need to read it. We’re going to play this as a constant stream of eighth notes (that is, two evenly spaced notes to each beat), and we’re going to loop it over and over (and over). Set Tempo to 50 bpm. The click should be accented, so tap on the LED to cycle through the sounds until this little > is displayed. Set the Beat to eighth notes. Do Bury The Click for a few seconds, but just on one string. Count out loud: “one and two and three and four and” with the numbered beats landing on the beat (where the LED flashes). Now, play our little C major scale fragment up and back in a continuous loop. Put your notes as on top of the clicks as you possibly can, just like when you do Bury The Click. Got it? Ok, let’s take off the training wheels. …and repeat steps 3 to 5: one-string Bury The Click, count out loud, play the scale fragment in a loop. Got it? Ok, here’s where the real Bullet Time exercise begins. 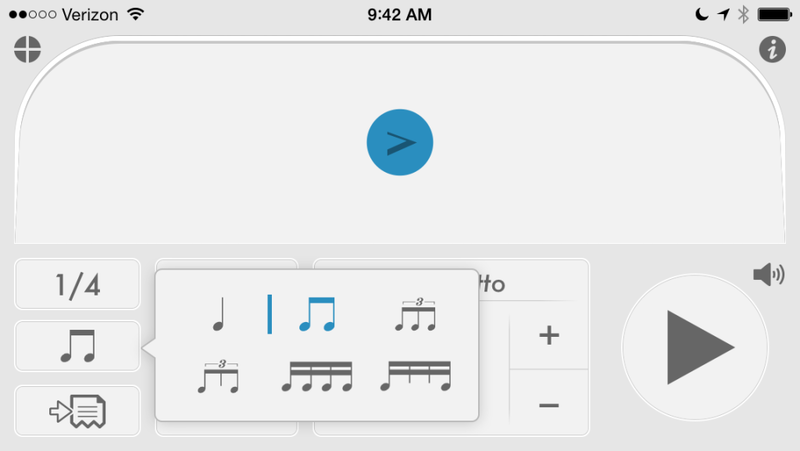 Once you’ve settled into the groove, tap the minus sign twice to shave two bpm off the tempo. Find your way into this new tempo: one-string Bury The Click, count out loud, play the looped scale fragment. Get it feeling solid and groovy, shave another two bpm off the tempo. Repeat Step 10 until you can’t hang anymore (either because it’s too damned slow or because you’re out of practice time for today). When you first start doing Bullet Time, you’re probably going to be besieged with thoughts about how boring it is. But stick with it for a minute, will yourself to be fascinated, and you’ll start to notice stuff you hadn’t before. Oh hey, my thumb isn’t in the best spot, and it’s making my hand approach the fretboard at a weird angle. Why am I squeezing the pick so hard? Hmmm… I get a little ahead of the beat every time I move between strings. Let’s see if I can fix that. Of course, what gets noticed will be different for each of us, and many of the things will be far too subtle to capture in tidy little sentences like these. This, my friend, is the very essence of practicing. Preach on, Brother Heany, you’re doing the lord’s work. Next we’ll learn another one of my ridiculously-named exercises, The Two-Legged Table.